No recent retirement announcement has stung racing fans quite as much as Dale Earnhardt Jr.’s did today. Sure, he’s 42 and we should all have expected this, but he simply feels like one of us: a straight-talking man of the people—the likes of which the hyper-polished world of NASCAR could use a lot more of. 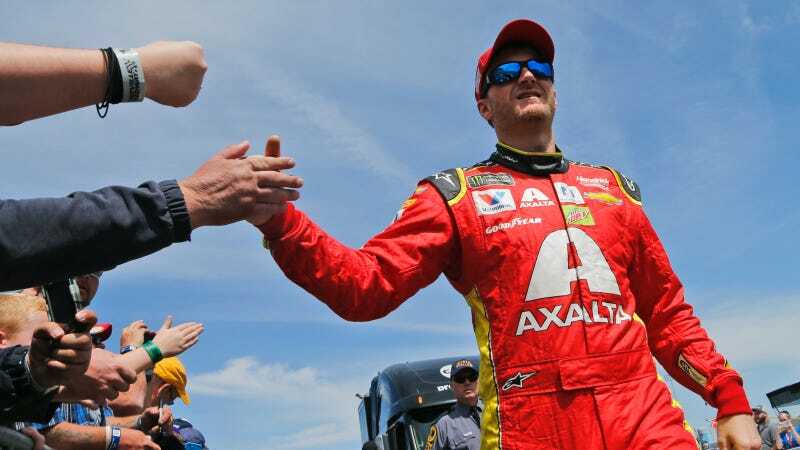 Dale Jr. may have started his career as the son of NASCAR legend Dale Earnhardt Sr., who died in a crash at the Daytona 500 just two years after his Dale Jr. joined him in NASCAR’s top-tier Cup Series. “The Intimidator,” as Dale Sr. was called for his aggressive driving style, is tied with Richard Petty and Jimmie Johnson for the most number of NASCAR Cup Series championships won. While being the kid of the Intimidator could have easily overshadowed everything Dale Jr. did, Junior had a worthy career on his own, a knack for winning at Daytona and an endearing tendency to dedicate race successes and even whole No. 3 cars to the memory of his dad. He quickly figured out how to tug at everyone’s heartstrings while making his own name in the sport, endearing him to NASCAR’s family-centric audience. Even if NASCAR isn’t your favorite kind of racing, it’s just hard not to like a guy like Dale Jr. He’s a man living out our most wonderful redneck-with-some-cash fantasies, and more than willing to let fans take a peek at his adventures online, in podcasts and on TV. Years of racing haven’t seen to have jaded him, either. When he gets talking in that excited, hyperactive twang of his, you get caught up in the moment right along with him. He sometimes stutters through his interviews, but in an honest, believable way. Junior even fesses up up to spending too much money shopping online for track memorabilia. But just as life isn’t all mud-covered joy and V8-powered fun-time, Earnhardt was never afraid to speak out on more serious topics, be it the NASCAR controversy of the moment or the controversial Muslim ban. He’s not afraid to put his opinions right on Twitter to his fans, either, even jumping in to defend them in his trademark no-nonsense style. One of the more important things Earnhardt took a stance on was something the NFL and other sporting organizations have gotten wrong and brushed under the carpet for years: concussions. Dale Jr. made his concussion recovery last year a very public deal, advocating for better care on behalf of racers and other athletes who suffer traumatic brain injuries. He became one of the most prominent voices in the fight for sports to take concussions seriously, opening a lot of eyes as to how to what happens when a racer gets a concussion and how to properly recover from one. It’s more than fair to say that this race car driver gave us a more frank, honest discussion about traumatic brain injuries than the NFL or any contact sports ever did—he was even open about how it informed his decision to retire today. Fortunately for racing fans, I don’t think Earnhardt will go far from the sport. He still co-owns the JR Motorsports Xfinity Series team, and told Sports Business Daily that he’s open to doing more broadcasting work in the future. Motorsports are Earnhardt’s passion, and even though I’m sad to see him leave the driver’s seat, I’m excited to see what Earnhardt will do next.